In love with all thermomumma’s bread recipes ( see link above) When I thought we’d lost them because they were no longer to be found on the recipe community website, ridiculously, depression had set in. (note print off your favourite recipes just in case) As soon as they were discovered on a new blog, of course I had to make one up and retest. Around midnight these glorious soft fresh raisin buns popped from the oven. And the smell of bread baking woke miss 14, together we had a midnight feast of raisin buns. Completely wrong but soooooo good. 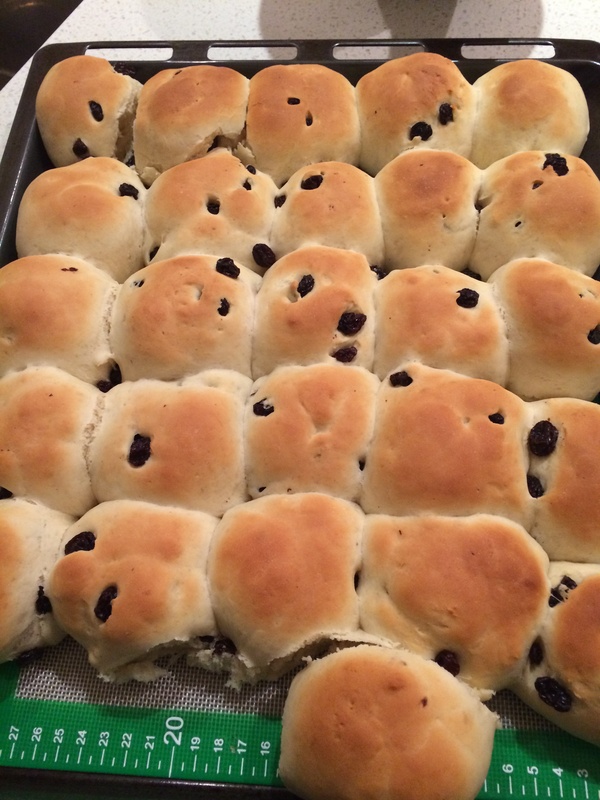 This is her sweet bun recipe made into raisin buns instead of iced finger buns. But they can be made into scrolls, plain sweet rolls, iced buns, custard buns and perfect frozen straight after cooking and cooling. You can reheat in microwave so easily or pop into lunchbox frozen, defrost perfectly by lunchtime. Awesome recipe.